After days of spreading misinformation to the police, council and opposition groups, the National Front finally held their annual ‘White Pride’ demonstration at Swansea Castle on Saturday. By doing their best to convince residents that it wasn’t going ahead and keeping their rally point secret – it was obvious that the organisers didn’t expect any public support and were worried about the size of the opposition. Unfortunately, one group that fell for the trick were Swansea Unite Against Fascism (UAF) who called off their counter demo after apparently being assured by police that the event wasn’t going ahead. However by midday groups of skinheads were congregating in the vicinity of Castle Square around Yates bar, and a diverse counter-demonstration was gathering in the square itself. Around thirty NF supporters unfurled fascist banners outside the castle, they were quickly outnumbered by around 100 antifascists on the other side of the road. The NF found themselves served with restrictions by police, and were ordered to disperse after only an hour. As they were being dispersed a few up for it antifascists were able to directly confront the White Pride supporters. A small scuffle broke out and a fascist flag was snatched before the NF could be escorted to Ice bar on Wind St, where the boneheads consoled themselves by getting pissed and shouting racist abuse. After Ice bar, the NF were escorted up to another bar – Static on Kingsway, where antifascists kept watch behind a police cordon. A phone blockade was organised , and the bar’s management in Bristol responded by travelling to Swansea in order to have the racist crowd removed. The NF were then quickly marched by police to the station and made to get on a train. “South Wales Antifascist Action had a 30-strong bloc and we opposed them every step of the way. It seemed like some kind of pathetic racist pub crawl facilitated by the police, who seemed content to turn a blind eye to all the harassment the NF were causing to Swansea residents. Officers could even be seen exchanging handshakes with NF supporters outside Static. It’s really troubling that they would fraternise in this way with people who were shouting racist insults and threats of violence during the day,” said Al Brown. Quiet a lot of info on last year’s event here and here and this is the Facebook event from last time. The White Pride demo pulled about 60 fascists who were opposed by 300-400 anti-fascists. The demo was followed in the evening by a Blood and Honour gig hosted at the Valley Commandos Motorcycle Club. VCMC denied all knowledge of the event’s true nature, but given that their logo is an SS death’s head and they appear to have hosted neo-Nazi events before (see comments here), it does make you wonder… Hopefully they will not be repeating their mistake and hosting Nazis again. .. and didn’t tell anybody. They seem to be hanging their nazi fishing rods outside an ‘international food store’. The mind boggles. Luckily someone managed to extract the snaps they took of themselves from the Worcester EDL facebook page before the EDL mysteriously removed all trace of them? Local people didn’t seem too pleased to hear about the EDL’s ‘flash demo’ in their town. 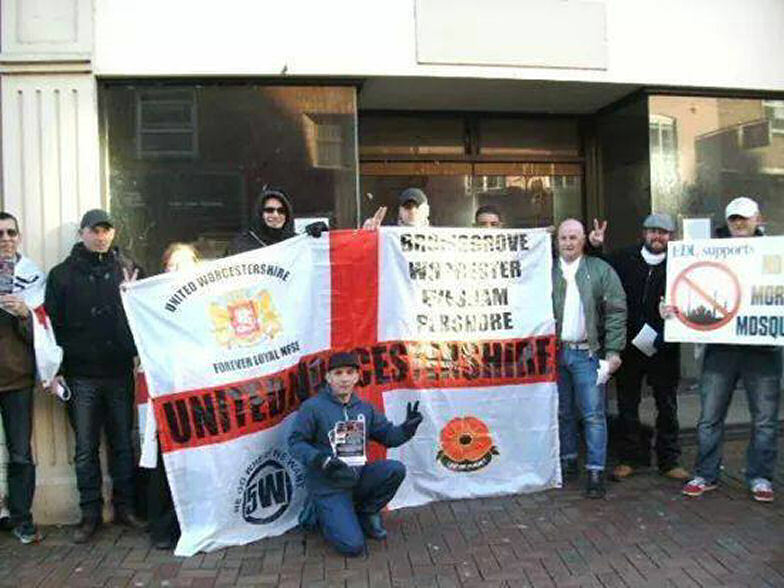 Looking like the state may be turning on its very own bootboys – The English Defence League. From the Birmingham Mail (Jan 19). Police are to make a fresh appeal to identify up to 100 demonstrators involved in bloody clashes at an English Defence League march last year. Smoke bombs, cobble stones, bottles and coins were hurled at police as the English Defence League and their opponents descended on Birmingham city centre for simultaneous demonstrations. One policeman suffered concussion during scuffles while other demonstrators were left bloodied by missiles and clashes with police in the shadow of the city’s new library. 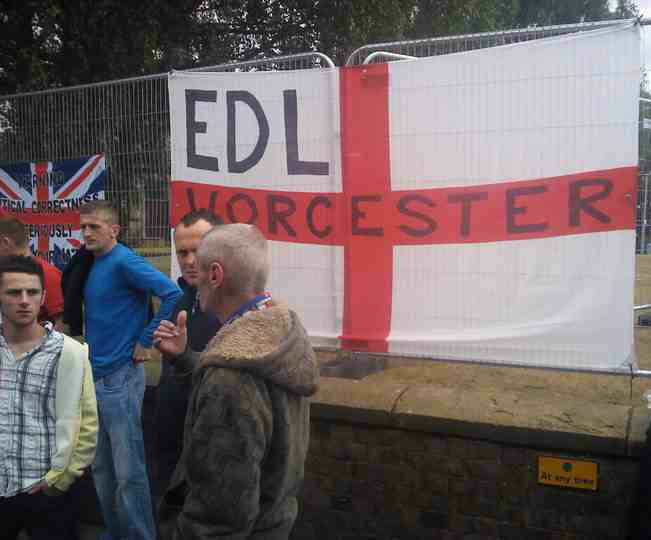 An estimated 2,000 EDL supporters poured into Centenary Square last July, chanting hate-filled anti-Islam slogans. In Chamberlain Square about 300 people – some hiding their identities by wearing balaclavas – from Unite Against Fascism turned out for their counter-demonstration. More than 1,300 officers from 12 forces were drafted in for a £1 million pound operation designed to guarantee public safety. It was West Midlands Police’s most expensive ever policing bill. Set against the backdrop of soldier Lee Rigby’s murder, and three bomb attacks on Midland mosques, the demos were held at a time of heightened tensions. Around 20 arrests were made at the time with 16 further suspects from across the country being detained and bailed since the incident. But police have spent the last six months scouring CCTV footage of the rally and say it has given them access “to a wealth of exceptional quality footage” likely to provide “significant investigative opportunities to bring a large number of offenders to justice”. It is understood that officers have managed to collate images of up to 100 suspects and an appeal will be made to identify them on BBC’s Crimewatch programme on Wednesday. A spokesman for West Midlands Police said: “A team of detectives continue to investigate disorder which broke out at Birmingham’s EDL demonstration in July 2013, and to date 16 people have been arrested post incident. “Those detained have been arrested from across the country – from Newcastle to Exeter – and they remain on police bail pending further enquiries. Last night online EDL chat forums were buzzing with activity as members discussed impending arrests and the upcoming Crimewatch appeal. A spokesman for fascist monitoring site EDL News said: “Some EDL who were there have gone on social media sites, saying they are planning to hand themselves in to the police in an effort to pre-empt ‘a knock on the door by Old Bill’. 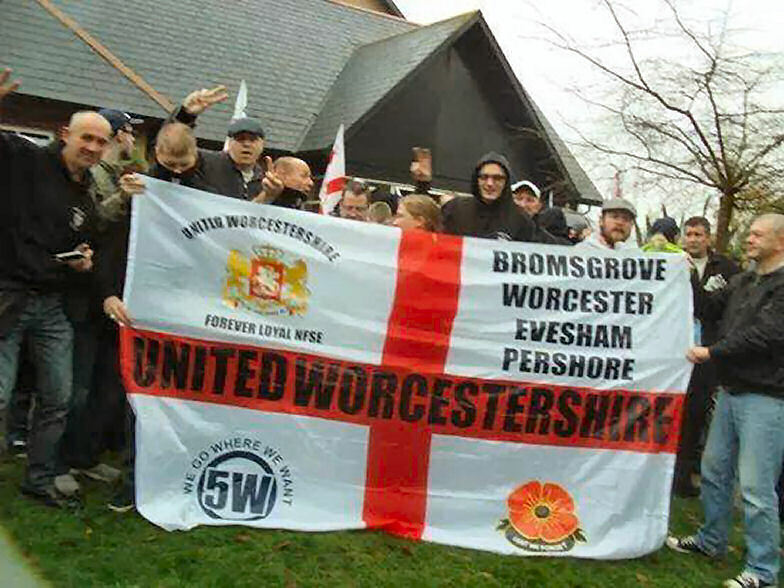 The EDL and its splinter groups have held five demonstrations in Birmingham. The first two, in 2009 and 2010, resulted in serious disorder while others in 2011 and last January passed peacefully. But the July 20 demo last year marked a return to violence. In a move criticised by some, EDL supporters had gathered from late morning at Broad Street’s Bar Risa as agreed beforehand with the police, who were keen to keep them in one place before the official rally. Anti-Islam chants were soon echoing as attendees queued at the bar for their pre-demo drinks. Outside, flags of St George boasting EDL divisions from as far afield as Grimsby were unfurled as members chanted “England Til I Die”. As the crowd gathered, more police riot vans lined up along the street, forming a barricade between the demonstrators on one side and onlookers on the other. At one point about 20 climbed on top of a small fast food van, prompting fears that the roof would collapse under their weight. Eventually, the EDL were escorted by a heavy police presence down Broad Street, at which point the first of a series of scuffles took place. Progressing towards Centenary Square, where the main demonstration with speeches took place, EDL leader Tommy Robinson, flanked by watchers, was quickly ushered to the staging area. But even as the speeches began, many of the EDL supporters clashed with police. One group clambered on top of a bus shelter while fellow EDL members held up the roof to stop its collapse. Others attacked the construction fence around the new Library Of Birmingham, only to find riot police waiting on the other side as they broke through. And as speeches from Robinson and others, speaking out against Islam, continued, flashpoints erupted from one end of Centenary Square to another. In the shadow of the ICC and Symphony Hall red smoke bombs were hurled at riot gear-clad police while fences surrounding the REP Theatre were also attacked. On the other side of the square plastic bottles, gravel and coins were thrown at a line of police. While cheers rang out every time a missile found its mark, one man pulled up a cobble stone, smashed it in two, before covering his face and hurling it at the line of police. During the disturbances some suffered head injuries and were seen wandering around with bleeding wounds. One appeared to be hurt when fencing around the library was pulled down on top of him. Robinson told the gathered crowd that the EDL wanted CCTV cameras returned to Washwood Heath and Sparkbrook. Around 200 cameras – costing £3 million – were removed in 2011 after an outcry from local communities concerned about civil liberties. Robinson also said the jailing of six Birmingham men, who planned to attack an EDL rally in Dewsbury, was behind the protest. As the EDL were gradually ushered to waiting coaches along Broad Street, some broke through lines at Regency Wharf. A window at the Blue Mango Indian Restaurant was smashed as a small group ran along the canal towpath and plant pots were strewn around. But with coaches waiting and the afternoon heat taking its toll, the earlier anger of the group faded as they waited to be released by police. Broad Street re-opened at about 6pm and council clean-up crews arrived to tidy litter and debris before the crowds of regular Saturday night revellers arrived. As the clean-up continued West Midlands Police Assistant Chief Constable Sharon Rowe hailed the operation a success. “A great deal of time, effort and thought has gone into today’s events and it is reassuring to see that both demonstrations have largely passed off without serious incident,” she said. “We are aware of some instances of criminal damage and a number of assaults have been reported, which will be the subject of our ongoing inquiries as we move forward from today’s operation. “Most people who came to Birmingham to go about their daily business in the shopping areas would have done so without having been greatly affected by the protests, which is pleasing. “Arrests were made where necessary and further inquiries will be made to determine if any other offences were committed.